Manchester United can breathe a little easier as the long-awaited move for Willian will be completed in a few days according to club sources. Italian outlet Tuttosport claims that Chelsea have accepted a bid of £66 million for the Brazillian winger. It is also reported that Chelsea’s captain Gary Cahill could be part of the deal. 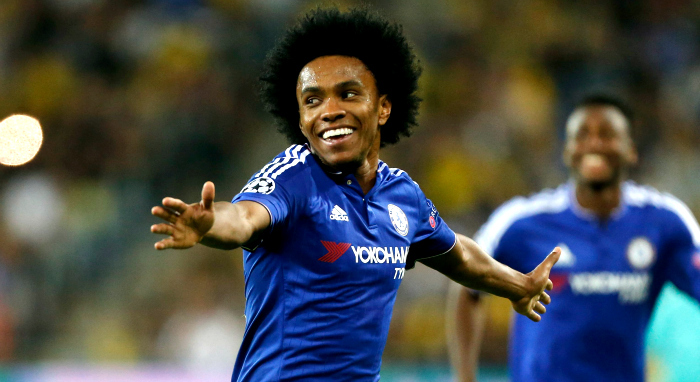 Willian had been linked with a move away from the Bridge after falling out with former boss Antonio Conte. It had been thought in some quarters that the arrival of new coach Maurizio Sarri could sway the player’s decision. But apparently, the player has made up his mind to leave the Blues this summer. It is no secret that Mourinho wants a right-sided forward and a centre Back. Gareth Bale was earlier linked to the club but the arrival of new Madrid coach Lopetegui has halted his wish to leave Madrid this summer. Also United have been looking for a competent Centre back with Toby Alderweireld and Yerry Mina linked to the Old Trafford outfit. The Chelsea fans will obviously frown at Cahill leaving Stamford Bridge to Old Trafford as he is considered an icon at the club, and many supporters have not forgotten about the sale of Nemanja Matic to United last summer. If United can get Gary Cahill alongside Willian in the deal then Ed Woodward should be given an award as this would strengthen the club as well as weakening a direct rival.